Clinical trials are research studies that involve people. These trials are available for all stages of cancer, and are an option for patients to consider. They are the final step in a long process that begins with research in a lab. Munson Medical Center has participated in cancer clinical trials for more than 30 years as a member institution of a program sponsored by the National Cancer Institute. Based at the Cowell Family Cancer Center in Traverse City, Munson Healthcare's Cancer Research Program offers patients in northern Michigan the ability to participate in large, national research trials while remaining at home. We participate in a network of 11 west Michigan hospitals, health care systems, physicians, and researchers who work together to provide cancer education and access to new cancer clinical trials. This consortium was one of only 46 community sites across the country selected for national funding, and one of only three sites in Michigan. New trials become available monthly. 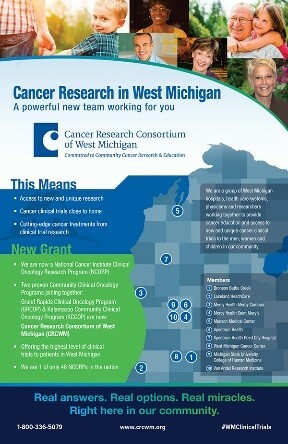 For more information, visit the Cancer Research Consortium of West Michigan website. Munson Medical Center also implements cancer clinical trials sponsored by pharmaceutical companies, which often provide the newest cancer treatments before they become widely available. We also work together with Michigan Medicine researchers and clinicians to bring more trials to northern Michigan. For more information, call 231-392-8400 or email cancerservices@mhc.net. 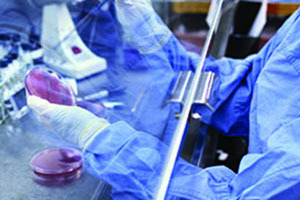 Visit National Cancer Institute website to learn more about available clinical trials.